Undoubtedly, the most important heavy-duty machine that is extensively used in the construction industry is the crane. Lifting heavy weight materials and loads at the construction sites cannot be imagined without the use of cranes. These machines consist of hoist, ropes, cables, boom, hook and other elements. There are many different types of cranes available on the market. Although, they are all used for completing similar tasks which is lifting heavy items and materials, each model is used for a specific purpose and comes with unique specifications and configurations. One particular crane category that has gain popularity over the years, is the mobile crane category. This category consists of several useful crane models which are heavily used and are included in every major project: all terrain crane, crawler crane, aerial crane, railroad crane and several other models. 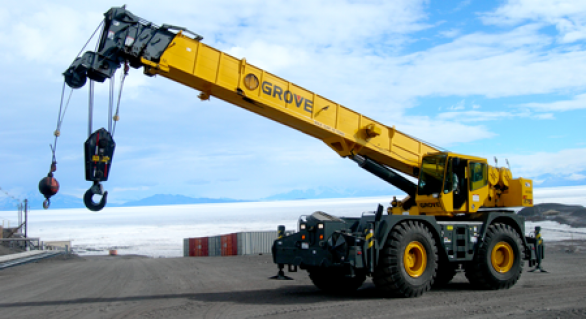 These crane models, thanks to their increased mobility, provide many advantages for construction workers and contractors all around the world. Among them most commonly used are the crawler and all terrain cranes. Read on to learn the difference between these two construction machines. All Terrain Crane. As the name implies, all terrain cranes can be used on all kind of terrains and under any weather conditions. The all terrain cranes can easily move through sand, gravel and can travel smoothly on asphalt roads and highways. This is a significant benefit provided by the all terrain cranes because construction sites are actually remote sites with no appropriate roads nearby. Generally, the all terrain crane has a four wheel drive system and is powered by one or two engines. An all terrain crane is equipped with a telescopic boom that can be hydraulically extended to reach heights from 50-100 meters in the sky, and can lift loads of 100-1000 tons. The all around flexibility of the all terrain crane makes it an ideal machine for completing numerous lifting tasks in no time. Once the job is completed, the all terrain crane can easily move from one construction site to another without difficulties. Crawler Crane. Another popular mobile crane is the crawler crane. This machine is mounted on a undercarriage and comes with a set of tracks for movement on the ground. The set of tracks provide increased mobility and stability. The lifting capacity of the crawler cranes ranges from 400-2000 tons depending on the model, and they can reach up to 200 meters in the sky. The crawler cranes have their own advantages and disadvantages. Their main advantage is that they can move on the ground easily thanks to their set of tracks. No outriggers are needed. 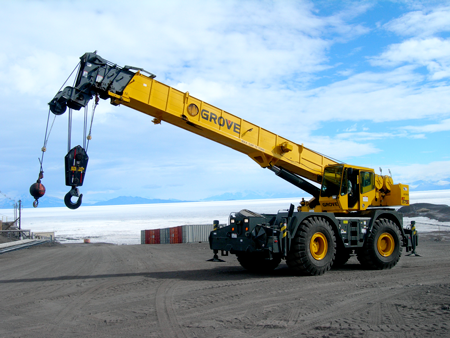 Furthermore, the crawler crane is capable to travel while loaded. On the other hand, the biggest disadvantage of the crawler cranes is their size and weight. These machines are much bigger and move slower when compared with the all terrain cranes. Because of their weight, the crawler cranes cannot be moved easily from one place to another. Once the work is completed, the crawler crane is usually dismantled into smaller pieces for easier transport.